Ensuring Aurora continues to meet the sport and recreation needs of a rapidly growing community came into sharp focus on Thursday night as Sport Aurora held its all-candidates debate. 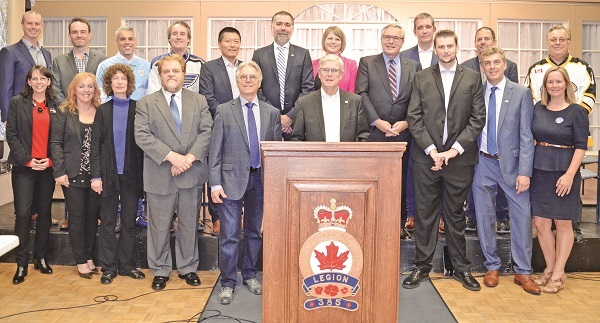 Hosted at the Royal Canadian Legion, it was the last of three all-candidate sessions this election campaign following similar meetings facilitated by the Aurora Public Library and the Aurora Chamber of Commerce. Over the course of each election campaign, Sport Aurora, the organization which represents over 40 community sports clubs and groups, hosts a debate with sports and recreation being the key focus. This year, ensuring that all Aurorans have facilities that meet their needs was a thread was woven throughout the night. Each mayoral candidate – John Abel, Chris Ballard, Geoff Dawe, and Tom Mrakas – had the opportunity to answer this question, each tackling the subject in their own way. A commonality in what each offered the over 150 people in attendance, however, was a pledge to collaborate with neighbouring municipalities and, in some cases, businesses, to meet these needs. First up was incumbent Geoff Dawe who said work has been done this past Council term to improve and increase services. A key land opportunity, he said, was provincially-held land near Cardinal Carter Catholic High School on Bloomington Road, a property the Town has been trying to secure for a number of years. Mr. Dawe also cited a motion made over the outgoing term by Harold Kim to study a new multi-purpose recreation facility, ideally on the Bloomington land, for the decade ahead. Mr. Dawe said he and Aurora CAO Doug Nadorozny have been exploring partnership opportunities on just such a facility with King Township. King, in turn, has been in talks with Seneca College for the same purpose, he said. Next to tackle this issue was Mr. Mrakas, who said politicians and elected officials, “over time” have become “short-sighted” when they look at facilities, “looking at the ‘now’ instead of looking into the future” decades down the road. Mr. Ballard, on the other hand, said all candidates could agree that there aren’t enough playing fields, nor is there enough built infrastructure, to meet current demands. More needs to be done, he said, to facilitate unstructured play. Last to tackle this question was Mr. Abel, who underscored his position in favour of repurposing existing facilities to address current and future demands. Repurposing is a plank of the Parks & Recreation Master Plan, he said, and a prime candidate for repurposing would be Machell Park to allow for a sports hub in Aurora’s downtown core. Noting at least two gymnasiums side by side would act as a driver for sports tourism, allowing for volleyball tournaments as just one example, he too touted the Bloomington lands as a prime opportunity. “Good planning pays,” he concluded.